Chicken sandwich is a popular food item in all over the world. In our busy life, no one have the time to prepare the food in time and so it is easy for them to make this simple recipe within minutes. This is an Indian style of recipe using the bread slices. It has a unique taste with the mixture of pepper powder and mayonnaise. It is one of the favorite snack item for children and grown-ups. It is really a tasty food and can be served as a evening snack or nalumani palaharam. 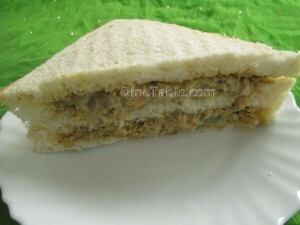 Try this spicy….yummy….chicken sandwich and enjoy! Take a pressure cooker and add chicken pieces, water, and salt then cook for 5 minutes. Let it cool down a bit and shred the chicken. Take a bowl and mix mayonnaise, chopped tomato, chopped onion, chopped capsicum, chopped celery, salt and pepper then mix well. Mix it with chicken pieces and refrigerate for 10 minutes. Now lightly toast the bread slices .Then take the bread slices and spread this chicken mixture on one side of the bread and keep another bread slice over it and cut it diagonally. Tasty chicken sandwich is ready.